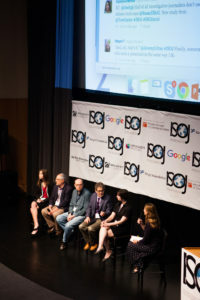 The first research panel discussion at the International Symposium on Online Journalism(ISOJ) on Friday, April 15, covered topics ranging from accountability journalism, journalists’ security and use of Twitter, and the employment of virtual worlds in storytelling. Research on these topics was presented at the Blanton Museum of Art, on the campus of the University of Texas at Austin. The discussion was led by Amy Schmitz Weiss, the ISOJ research chair and an associate professor at the School of Journalism and Media Studies, San Diego State University. James Breiner, of the University of Navarra in Spain, presented his research titled “The Economics of Accountability Journalism: What Price is Right?” His study looked at the difficulties of building an economic model around investigative journalism. Because investigative journalism is usually subsidized by advertising or even by tax dollars in some countries, he claims it has never been priced in a true economic market. However, it has a good return on investment when looking at recovered tax dollars or through the fines levied as a result of an investigative report. And the audience for investigative reporting exists, he argues, as evidenced by ground-breaking reports such as Swiss Leaks and The Panama Papers. But the real question is, how much will users pay and how many users do you need to support an organization conducting investigative journalism? Through several examples of media who get their funding through a small and dedicated base of readers, he argued it’s important to build a good relationship with a core group of readers instead of going for scale. But he left the audience with this lingering question: Whether through public subsidies, non-profits/grants, relationships, subscriptions, paywalls or even pay-per-story, who is going to pay for accountability journalism and how much? Susan McGregor, of Columbia University, presented her work with Elizabeth Watkinstitled, “Security by Obscurity: Journalists’ Mental Models of Information Security.” The two scholars found that with all of the recent awareness of how little data security people have, not many journalists are taking steps to protect their own data. Half of investigative journalists, who tell stories in a field that partially relies on leaked data, are not using information security tools as part of their work, including protected sources. Further, less than 40 percent said they changed their communications methods with sources after the Edward Snowden revelations about spying by the National Security Agency. So why aren’t journalists taking steps to protect their data? McGregor approached this question through “mental models,” which is a mental system people use to work through processes and make decisions. Through in-depth, semi-structured interviews with 15 journalists and seven editors about security preferences, practices and concerns, the researchers found two overarching themes. First, the need for information security was related to the specific beat, geography or story being covered. Secondly, the journalists addressed any concerns by meeting face-to-face with sources. In other words, if the reporter felt that the topic might be sensitive or that they may be targeted, they opted for in-person interviews to alleviate any potential digital security issues. Otherwise, they weren’t concerned and felt that their obscurity was their security. Hence, “security by obscurity” becomes the mental model. However, McGregor cautioned journalists who may think they are out of the crosshairs of data attacks due to working for a small or otherwise obscure organization. “If you are affiliated with a journalism organization, you are NOT obscure,” she said. Her suggestion for news organizations is to clearly communicate the existence and origin of attacks and to be engaged directly in efforts to explain how digital communication and security precautions can be used effectively. Jeremy Littau, of Lehigh University, presented his work with Mi Rosie Jahng, of Hope College, “Interactivity, social presence and journalistic use of Twitter.” Their research was founded on how credibility is formed on Twitter, especially in breaking news situations. Littau said they wanted to know what factors go into Twitter users “snap judgments” to determine if a journalist is credible. He broke it down into two parts: interactivity and social cue. Interactivity is the amount of replies, public replies, retweets, quoted tweets and social cues involve how much personal information a user shares. A high social cue involves personal information while a low social cue is more focused on professional information. Their overall question was how interactive journalists are and how social cues factor in. They conducted a content analysis of 555 journalists’ Twitter profiles (from an international population). They found high amounts of social presence were strong predictors of high interactivity, and that the job of the journalist mostly drives that interactivity. Lifestyle and technology journalists had the highest social cue, while sports, civic and media/entertainment had the lowest. The implications are that social presence is a bridge to interactivity, something that many newsrooms need to improve on. “If we want to help our reporters engage with our audiences, one of the first things we need to teach them is to open up,” Littau said. The last presentation was by Leonard Witt and Claire Bohrer from Kennesaw University, along with Gwenette Writer Sinclair, the CEO/owner of 1 Virtual World Development, on Skype. Their paper, titled “Journalism: How One University Used Virtual Worlds to Tell True Stories,” was also co-written by Farooq Kperogi and Soloman Negash. They talked about the use of virtual worlds to construct sets and avatars that can be used to act out real events. It was envisioned mainly to give journalists a way to visualize a story where anonymity is important. For example, interviewing a child who needs anonymity, the child’s narrative can be rebuilt in a virtual world to show viewers what happened without compromising the source’s identity. Students from various disciplines were brought together to work on this project, which started with learning how to create, adjust and assemble items in the virtual world and then turned to how to use them in a journalistic way. Interviews with subjects, documents and even photos of real-world locations were used to construct the sets and stories. The virtual worlds allow a great deal of flexibility because sets can be very controlled and users are led through or sets can be wide open for users to experience through virtual reality headsets. Content created through this project can be viewed at Virtualworld.jjie.org. All of the ISOJ research papers can be viewed at the ISOJ Journal Multimedia site. ISOJ continues on Saturday, April 16, and is being livestreamed in English here and in Spanish here. 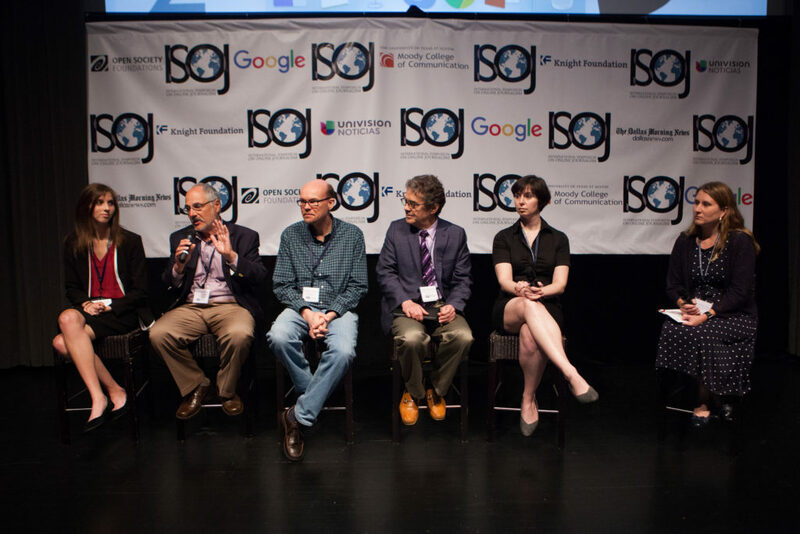 ISOJ 2016: Research Panel, from Knight Center on Vimeo.